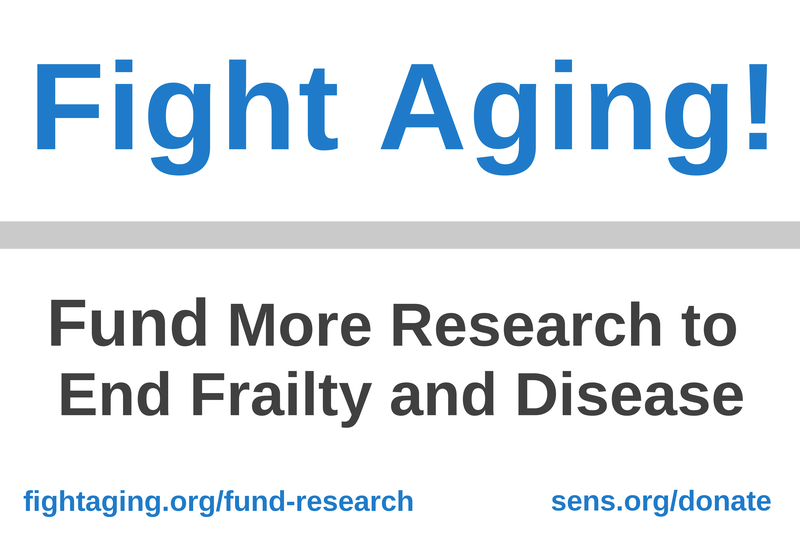 A Look Back at 2015 in Longevity Science – Fight Aging! I think that in years to come, we'll consider 2015 to be the point at which things really started to move for SENS rejuvenation research. It has to be said that medical research moves slowly at the best of times. It takes a good long run-up to show results, and it took a decade for SENS to grow from an idea and a few interested researchers to its present state of a foundation, the support of leaders in the research community, a loose network of research groups, and a few newly formed startup companies. It is perhaps an appropriate year for the unveiling of the Methuselah 300 monument, listing the donors who provided the initial funds and support to start this ball rolling. 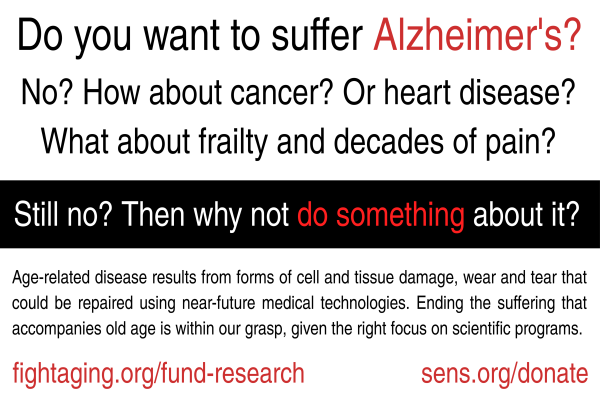 Crowdfunding by the longevity science community continues apace. We're still not as good at fundraising as our nearest cultural neighbors, the strong AI philosophy of development typified by the Machine Intelligence Research Institute, but a little friendly competition never hurt anyone. That branch of the strong AI community, like SENS and much of the radical life extension advocacy community, arose from the transhumanist communities of the past few decades, and many of the same people have interests on both sides of the fence. It seems reasonable to think that we can do just as well as MIRI and related organizations when it comes to pulling in funds for our goals in healthy longevity. This year the Fight Aging! matching fundraising held in collaboration with the SENS Research Foundation raised $250,000 for rejuvenation research, and an earlier crowdfunding project at Lifespan.io raised $45,000. We're improving year over year, but there's much further to go yet. On a completely different topic, a novel Alzheimer's theory is that accumulation of amyloid is due to a slow physical failure of drainage channels for cerebrospinal fluid near the nose. As a theory this has the attractive property that it is comparatively easy to prove or disprove, and the Methuselah Foundation funded a test this year - so we shall see. In other news, the types of age-related diabetes are multiplying again; the assignment of Alzheimer's disease as type 3 diabetes seems to be an ongoing unresolved debate, while researchers have recently produced a much more compelling set of data in support of a type 4 diabetes caused by a novel form of age-related immune dysfunction. In other positive news a team have now used saCAS9 in combination with AAV to perform somatic gene therapy on every muscle cell in a mouse model of Duchenne Muscular Dystrophy. If they can repeat the trick in dogs (an aminal that is a better approximation of human size) then this technology could move into clinical trials once more rigorous safety testing has been performed. The FDA is under immense pressure from the parents of DMD afflicted boys to approve some drugs that have been shown to do pretty much nothing in clinical trials. A no win situation for all parties except the pharma companies who would get to sell snake oil. It would be better if these patient advocate groups got behind this more promising technology and forced the FDA to speed up a bit on this. Forbes - DMD Drugs: An Existential Threat To The FDA? Actually, if you wanted to be Devil's advocate, you'd suggest to Liz Parish of BioViva that she starts offering this saCAS9/AAV gene therapy for DMD in Colombia. You can rightly argue that it hasn't been through safety testing. But right now there are no approved functional therapies for DMD, which is a horrible death sentence. While I'm a fan of AI research, I do wish the people involved with MIRI and AI would redirect their advocacy toward biomedicine like SENS. There are already so many people working on AI research and while AI might be helpful to people in the future (even though IMO thinks like AI and uploading are unlikely to save those of us now alive) a FAR better strategy is to focus on the biomedical therapies that will get us decades more life so that we can make it to the distant future. My first question was why my ad blocker hadn't removed this hideous thing from my sight. Then I realized it was supposed to be there. I hope you aren't using that image anywhere else, because it is probably increasing eye cancer by non-insignificant amounts. @Regex: That one didn't scale down so well from the full sized poster. I've replaced in the post for now. @Nico: I was going say something similar to KC's comment. There seems to be a synergy between the mapping of the genome (now we can speed research in the medical field/biology since it has been reduced to a digital platform), AI, nanotechnology, gene therapy, and biotechnology. All these fields seem to assist and overlap each other thus speeding up many area's of science including extending ageing. I assume (and certainly hope) that we will see (a lot) more advancement in this field in the next 5 years than in the previous 10 years due to this overlapping and exponential increase in knowledge. My birthday was on Dec 31. I hate it because I am getting older but hopeful that medical technology will give me (and others) a 2nd chance at life. Is there any data or graphic showing the evolution of investments on rejuvenation biotechnology?